All the obstacles of doubt, money, time and injury have faded away like Cinderella’s evil step sisters. (Couldn’t resist using a Disney reference) The goal that seemed impossible is now a reality. I can’t believe it actually happened, I did it!!! The completion of my 50th state. 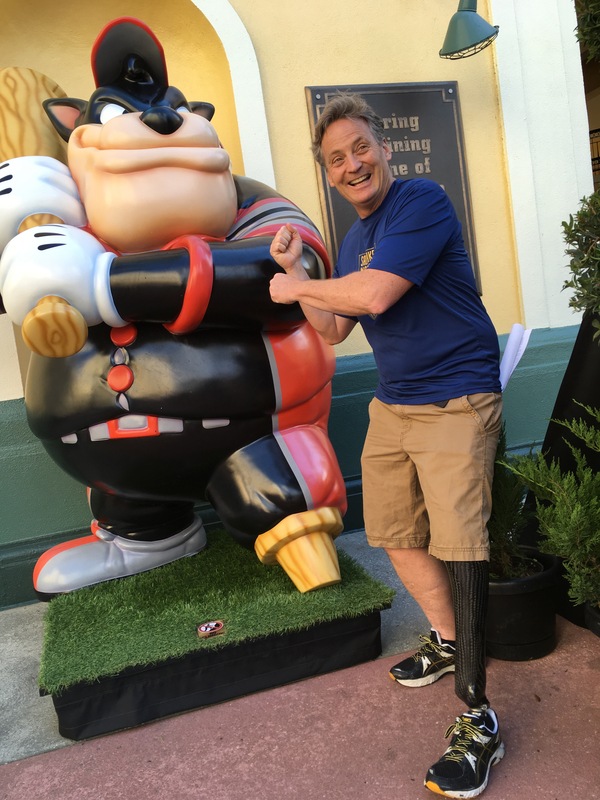 Facts about the 2017 Disney Marathon weekend. The Disney marathon weekend consists of many races over the course of 4 days. Kids races, 5k, 10k, 1/2 marathon, and Marathon. If you complete all the the races they call it the Goofy Challenge. You are awarded a medal for each race and then a special fifth medal overall. Sad fact, the 1/2 marathon was canceled this year due to the thunder, lightning and extreme weather the night before the race. You’ve never seen so many sad faces. But in true runner fashion many of the runners were out completing a 1/2 marathon course on their own in their Disney themed costumes (never underestimate the determination of a runner! It is the sixth-largest U.S. marathon and the second-largest 26.2-miler without a registration lottery or qualification requirements. Disney races have somewhat of a cult following (like most of Disney). The races sell out in a flash, often in a day or two. Plan ahead if you want to run it. While the temperature was wonderful the day we arrived there was a rain storm a few days later which brought the mercury down to 39 degrees in Orlando. Not exactly what I was planning on for Disney. With the humidity and wind chill factor it was a bit chilly on race day. The night we left for Orlando the snow was coming down in buckets and many roads leading to the airport had been shutdown. What should have been a 15 drive because of the weather turned into a 40 minute trip instead. After we did arrive there was a 4 hour delay on our flight because the snow was so thick on the tarmac that it was nearly impossible to move the planes around and get them lined up for takeoff! The wonderful people at JetBlue who had been so generous to give me discount flights in the past were now flying us for free round trip to Florida and back so I didn’t let Mother Natures uncooperative bad attitude ruffle my feathers. All of this weather related nightmare ended as soon as we arrived in Orlando. We were met by beautiful blue skies. Perfect 70 degree weather, and hundreds of tropical birds sweetly singing in the swaying palm trees above. We had arrived in paradise. I wasted no time changing from long pants and a coat to shorts and a t-shirt. We got our car and headed over to the hotel Shades of Green in Disney World that had been provided for us by Cigna and Achilles. This was a military hotel that we were graciously invited to stay at. It was very beautiful and so accommodating. We were given full park passes for every day we would be staying there and even spending money. I felt like a celebrity. 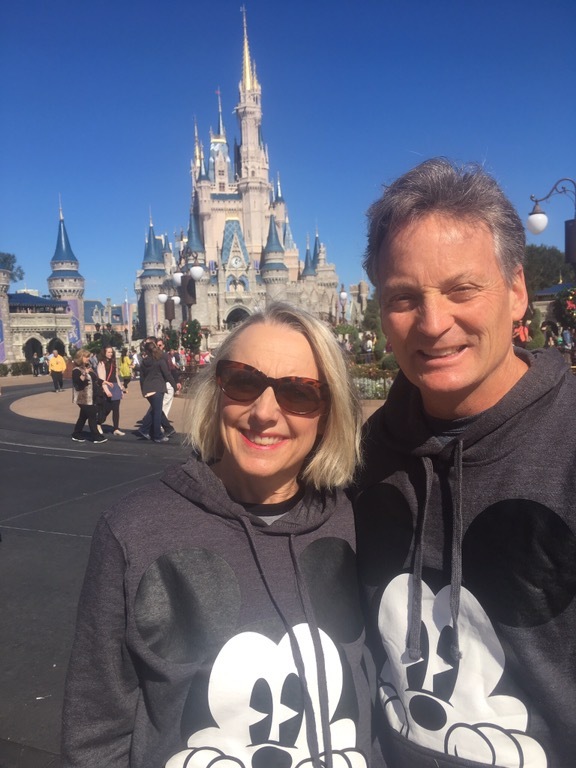 My wife Lynette and I were treated as royalty. After checking into our room we headed over to a house that had been rented by our children who would be joining us in another day. It was located just outside of the Disney World Park in a gated community. We needed to check out their accommodations and make sure everything was ok for them before they arrived. The house turned out to be better than I had imagined. Completely furnished, swimming pool, game room, plenty of bedrooms and bathrooms. Community pool complete with all the amenities just minutes away from the Disney World Park. So far everything was great. That night Lynette and I went to the Achilles Banquet. We sat next to Marc Fucarile, he is from Boston and I have to say he had one of the thickest accents I’ve ever heard in my life. When I introduced myself to him and he introduced himself back I made a joke and said, “Gee, let me guess where you are from!” He was there with his Sister and her kids. She started to laugh because I was being Captain Obvious. Turns out Marc was a spectator at the 2013 Boston Marathon. He was right next to the bomb when it went off. Marc is very lucky to be alive. Even the doctor who was taking care of him informed his sister he probably wouldn’t make it. Marc is an incredible person. 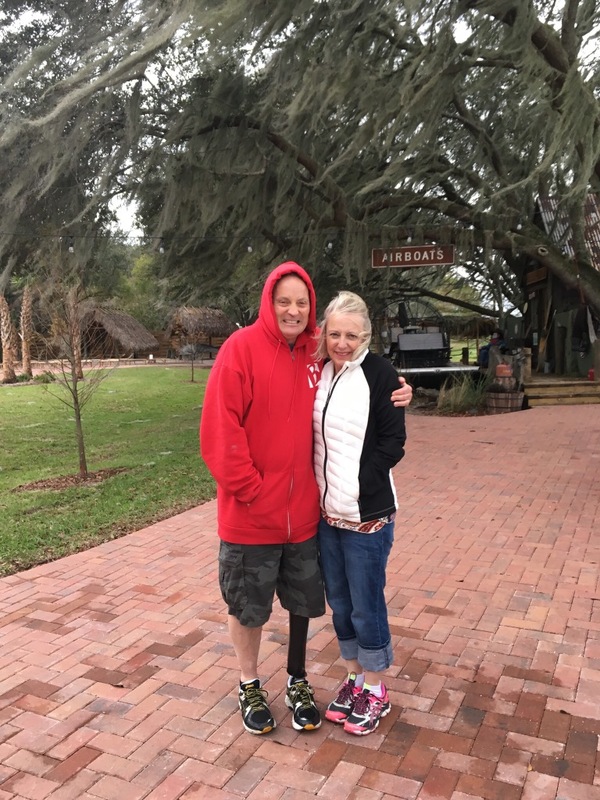 He lost one leg above the knee and has had multiple operations on the other leg. 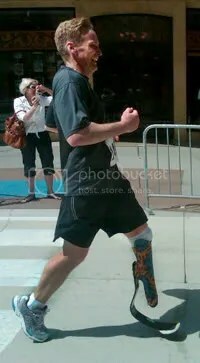 Not only did he survive but with the help of a prosthetic leg and braces he still competes in marathons. There are so many heroes who are members of and support Achilles International. I am so proud to be associated with such an incredible bunch of men and women. The weather took a turn for the worse. It rained all day and night Saturday forcing Disney to cancel the Half Marathon. So many sad and disappointed athletes. 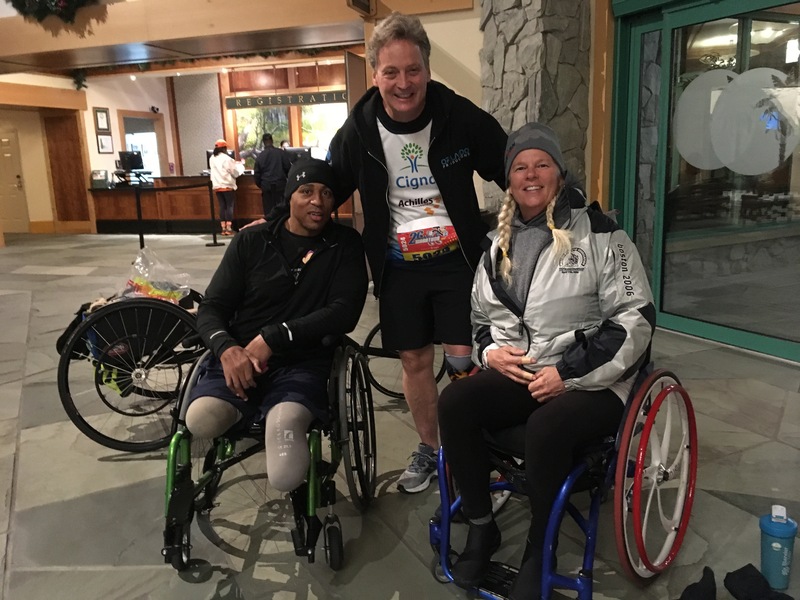 As it turned out of the entire Achilles team I was to be the only Full Marathon runner and Cedric king a freedom team member was the only hand cyclist. A good friend of ours Chuck Harvey, who lives in Anchorage, Alaska decided to fly all the way to Florida and run my 50th state with me. We met up with Chuck at the packet pickup area and arranged when and where to find each other on race day. I couldn’t have been more excited. Chuck is an amazing man and an amazing runner. 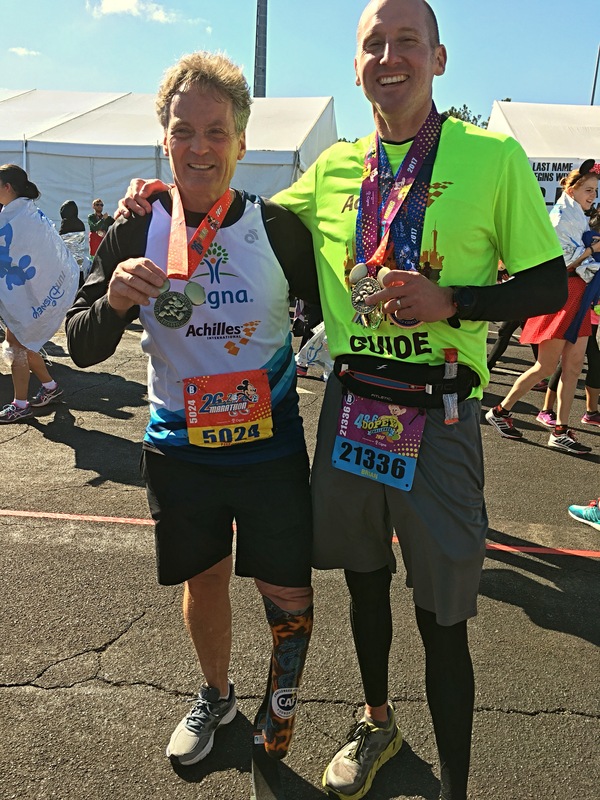 Chuck has overcome cancer and still continues to baffle his doctors by running race after race. In 2016 he completed 30 full marathons and 30 half marathons! Amazing doesn’t begin to describe this person. Sunday Jan 8th, race day. Wake up time 2:30am. Yea, I know, 2:30am. Nobody ever said running a marathon was going to be easy. I met the shuttle to the Epcot Center and the start of race at 3:15 in the morning. It was freezing! A very chilly 39 degrees. I know what you’re thinking, hey Tim you’re from Utah! Cold is your middle name. Well if I had been in Utah I would have been dressed for the weather. Have you ever tried to buy a ski mask or ski gloves in Florida? They don’t exist. Trust me. With the actual start time of 5:30 I had about 2 hours to wait around and freeze to death. My friend Chuck had no clue where or what had happened to me and just by a miracle he was able to find me among 30,000 runners on mile 10. My guide Brian Evanko is the President of Cigna US Individual & Voluntary Benefits. He graciously volunteered to be my guide. He was the nicest guy and a great runner. He had to double his normal finishing time so he could run with Tim the turtle. I’ve never said I was fast, far from it. The race went well all in all. Such a fun course starting at Epcot center running through the Magic Kingdom, Animal Kingdom, MGM and then back to Epcot. There was no shortage of runners dressing up in crazy Disney costumes either. I did not get the new PR I wanted for this marathon or the breaking my 5 hour marathon time as I had hoped. I struggled with my pre race runs prior to this race. I had a little frost bit on my stump in the 9 degree weather which prevented my leg from fitting for a while, then I battled two different colds. This gives me something to shoot for the future. 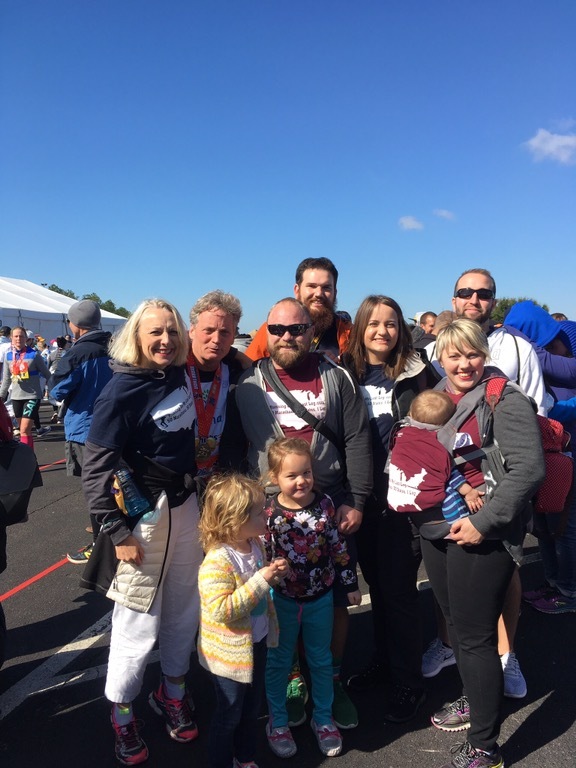 As I finished the race my daughter Danielle was there with her husband Adam and their two daughters Mae and Nina, My step daughter Vicki and her new baby Bentz and my step son Brady and his friend Greg were all there. And of course Lynette my wife. They got the entire area to chant “50 STATES, 50 STATES!!! !” as a crossed the finish line. The race ended and I was awarded my finishers medal. And of course everyone wants to know now that I’m done running 50 marathons in 50 states what am I going to do? You know I’m GOING TO DISNEY WORLD!!! Posted in 50 marathons 50 states amputee, Adapative Athlete, Amputee Costume, Inspiring People, Marathons, Prosthetic LegTagged 50th state, Achilles international, adaptive, amputee, blade runner, challenged athlete foundation, Florida, Inspiring People, lds, marathon, marathon man, mental-health, motivation, one leg, sports, Tim Hurst, walt disney maratonBookmark the permalink.